I hope the Holidays were a great time for family, food, and fun. But now as the New Year is here it is time to start thinking about and preparing for the next years camp coming June 10th and 11th. And how we do that is by getting started on a workout regiment that will put you in the best possible shape come June. Those of you who have been with us for a while have improved tremendously and we all love watching you perform and compete each year. To make sure you continue to improve and for the new “Stars” who join us physical conditioning is very important. You all should be working out 4 days per week for 30 minutes or more if you are up for it and your doctor says its ok. Walking to start is great, working up to jogging on treadmill or biking (stationary bike is perfect). Swimming is a great exercise to condition cardio as well as strength training, light to start, is a great way to prepare yourselves to be the best you can come June 10th. 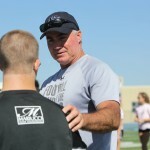 I look forward, as do all the coaches, to seeing you in June for the 10th annual “Football Camp for the Stars”.